There is HUGE value in the act of forgiveness. As humans we can be wounded, sometimes these wounds and hurts run deep. It can last a lifetime.Whether it’s verbal or physical these hurts can stick with us. 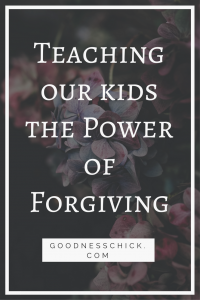 Teaching our kids the power of forgiveness holds tremendous weight in regards to character and quality of life. The ability to forgive can be challenging, sometimes it can take a lifetime. The reality is, it’s about the process and the willingness that can be the most freeing action imaginable. I believe that every one of us are our own novels with pages and chapters some will never know of. But these pages have a hand in defining us; molding us. As humans, we can become trapped in our past hurts. Sometimes, it’s the act of forgiveness that can ultimately free us. There is power in the ability to forgive. It is not easy, but so often it is necessary to move forward. This is a powerful lesson to instill in our kids and to apply in our own lives. Our past is a part of us, but it does not have to define us. I am not here to pass judgment, but rather put a spin on forgiveness. When we choose to not forgive it makes it virtually impossible to move forward. We can be stuck in what was; whether this is a situation, conversation, event or trauma. We can become trapped and imprisoned. It’s heart breaking. I’ve witnessed so many hearts that have the ‘pause’ button on and they can’t go backwards or forwards. They are stuck and unable to live fully.It’s unfair to them. Life can not be lived to our fullest potential when the pause button is on. There is power in forgiveness. It may not seem that way initially, but it can be the most liberating action we can do. When we harbor angst, hurt or resentment towards someone we end up walking around with an invisible book bag filled with invisible bricks. Sometimes these are bricks of anger, resentment, rage, anxiety, relentless sadness. Over time the bricks increase in quantity and it is physically and emotionally exhausting. Over time it impacts our relationships, our outlook on life and our quality of life. How unfair is that? The truth is really crappy things happen in life. Sometimes when we step in crap (a situation/ an event / trauma, etc.) it can be really hard to rid ourselves of the crap. When we choose not to remove the crap sometimes it’s easier to continue to step in all forms of it. We can even role around in it. This is when it makes life messier, more challenging and can ultimately become toxic. Take some time personally and with your family members and evaluate what your ‘crap status’ is. Is there a negative cycle that needs to be broken? Or are you and your loved ones in a good place? I say, be crap free. It’s so much easier. Share that with your loved ones. When we forgive it’s taking a big step forward…. It isn’t forgetting whatever it was, it’s releasing yourself and the person / situation, etc. Release yourself. Reaffirm with your loved ones that taking that step is a big one, but it is SO necessary for a healthy quality of life. There are times we need to be reminded that to forgive is ok. It isn’t easy, but it is healthy. Forgiveness may take years. It can be a process. Whether it’s something we pray about, seek insight from others about or allow ourselves to slowly release / let go …it’s a process. It’s one we must choose to take or to avoid. Know that it is a conscious yes or no that we can walk towards or away from. We do not have to (nor should we) tackle this process alone. Have a wing man. Seek out someone that you can confide in that has life experience, can be objective and is mentally healthy. When we harbor negatives it detracts from quality of life. As adults our patterns / decisions to forgive or not to forgive are messages that our kids receive. We set examples, whether we like it or not. We don’t want bitter kids, so why not send a message that deflects bitterness? Change and messages start on our front door. I believe resentment, guilt and blame can become cancerous. It can eat away at our core impacting all areas of our life. It isn’t easy, but forgiveness is super necessary for growth and to instill it’s importance to our kids because we want them healthy. Keep the message strong, positive and healthy. You can make crazy positive impacts that you may not be aware of for years. Remind yourself of that. Forgiveness is not an obligation. Rather, it is a source of freedom that can strengthen, free and empower. The quality of our life is impacted by our outlook. Even in the most trying moments, there is power in positive.